Good. Moderate wear on base corners and flap edges, faint scuffs, creasing and indentations on exterior, underneath flap and interior, scratches on hardware. 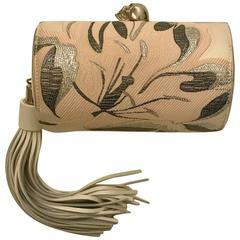 Alexander McQueen clutch bag comfortable and elegant. Fancy leather with skull studded with glitter like clasp closure. VERY GOOD CONDITION!